Headquartered in Ashburn, VA and founded in 1999, Warriors placed over 4,000 IT Professionals to date and will find stable jobs for another 16,000 by 2022. Warriors is a Recruiting Engine powered by great people and winning recruiting processes driving success at hundreds of companies right now. Our elite Recruiting Engine currently fuels 3 of the USA’s top 10 Defense Contractors, multiple Inc. 500 and Washington Fast 50 companies, and our Engine will drive your team to greater success. Right now. 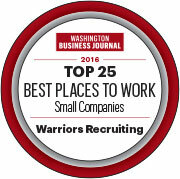 Named by the Washington Business Journal’s “Best Places to Work”, Warriors takes care of our people. Then they take great care of you. Each of our Recruiters successfully completes our elite Recruiter Training Program called, “Warriors U”. Our trained team members grow your business because we become you. We meet your Executive team to listen to your company’s story, we collaborate with your Human Resources leadership to understand critical processes, and we talk directly to your Hiring Managers to identify specific job requirements. We care about providing the correct Recruiting service for your business. Our Engine is your recruiting team. Teams Win. Warriors placed 637 IT Professionals in new jobs last calendar year. That’s $106,633,800 in revenue for our clients. Warriors mines our customized database of over 60,000 cleared IT professionals, we leverage social media platforms to tap into our IT community, and we scrub every major job board to source qualified candidates for your hiring managers. We submit screened resumes, and schedule interviews with your team. We can fill your funded IDIQ positions, backfill your existing staff, or we can provide qualified candidates for your Proposal efforts. You hire Warriors’ candidates directly to your payroll or if you prefer Warriors Can hire them directly. We are your Recruiting department. We manage your recruiting, and work with your Human Resources team to onboard new hires. You pay us to Recruit. You turn Warriors Recruiting on and off as you need assistance. We are your Recruiting Engine. •	Warriors’ “pay for performance” model provides access to top talent, but you pay no fee until you hire our candidate. •	Success Fees typically due within 15 calendar days from the start date.